We’re not afraid to admit that our fascination with small spaces has developed into somewhat of an unhealthy obsession. That’s because, for most city-dwellers and young homeowners, downsizing isn’t just a trendy thing to try—it’s the only option. And while you’ve heard us talk before of tiny living and the savvy space-saving solutions that ensue, rarely do we think about what it’d be like to have the opposite problem. Okay, so not everyone can relate to having too much space, but when you find yourself in said predicament, making the most of a palatial living room can be just as tricky as maximizing, say, a 100-something-square-foot apartment. Aside from strategizing a furniture layout that feels cohesive and cozy, filling a room with pieces that fit the sheer scale of the space can get pricey. When proportions are off or space isn’t divided properly, a large living area can quickly feel empty and unfinished. Given this challenge, we asked a handful of interior designers for the lessons they’ve learned when decorating an extra spacious living room. Ahead, five big rooms that master every inch— plus tips for pulling off a similar arrangement in your own roomy abode. When Genna Margolis of Shapeside learned that her client’s biggest problem was that her breezy Brentwood, CA home was too big, the designer swiftly stepped in with a trove of clever ideas to take advantage of the home’s proportions. “I decided on this layout because the living room needed to function as two spaces—one [area that was] comfortable for watching TV and another part that would accommodate the piano which was an heirloom,” explains Margolis. While most deem a room formal when they see a piano lurking in the corner, laid-back furnishings give the whole room a more relaxed and casual feel. Keep reading for Margolis’ advice for executing this same scene. One would never define designer Kate Davis’ edgy, European-inspired apartment in La Cienega as huge. That said, her one-bedroom spread boasts a seriously open living room—a space that required plenty of attention and thought before settling on a layout. With friends constantly rotating through the door, Davis decided on a dual living room set up where the space is divided into two visually independent hangouts. So how exactly did she make her sizable space feel so snug? “To make a large living room feel cozy, divide the room into separate areas if possible—maybe one smaller area moment next to a larger seating area, or flanking the room with back to back furniture into equal parts. Having too much floor space is one thing, but add sky-high ceilings on top of that and you have a serious undertaking. Just take it from Homepolish designer Rosa Beltran. When she was hired to overhaul this dreamy Mediterranean-inspired home in Altadena, California, conquering the 30-foot high ceilings was high on her priority list. Read on for a few of her other tips for maximing tall spaces. “With respect to area rugs, ideally all four legs of each piece of furniture would sit atop the rug. But, sometimes, to economize, we cheat it and let just the front legs of the sofa or chairs rest on the rug so we can get away with using a smaller size. Or, we layer a more costly rug atop a less expensive solid jute rug. Natalie Myers is no stranger to suiting up large living spaces. 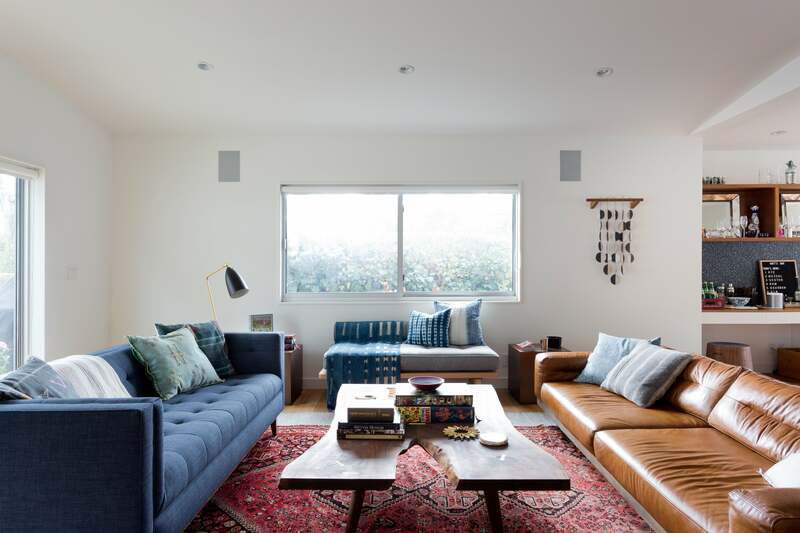 The Cali-based designer has worked with a number of clients who want to fix up mid-century homes, which often boast vast family rooms, large glass doors, and high slanted ceilings. For the living room of this retro ranch in Mandeville Canyon, Myers’ clients knew that they wanted an extra large L-shaped sectional for the family to lounge on. In addition to the sofa, the coffee table was also made to be a custom size that was large enough to unite the different sitting zones without leaving too much of a gap in the middle of the room. Ahead, the designer shares a few words of wisdom on mastering a similar footprint. Photography by Amy Bartlam. Design by Veneer Designs. If you’re working on a tighter budget, Margolis suggests checking out All Modern, Restoration Hardware, or Pottery Barn. “They all offer great sofas of various sizes at amazing prices,” she tells Domino.